An Easter egg tree is fun to decorate. Easter can be an exciting and spiritual holiday, and there are many fun ideas for Easter parties that use popular activities in new and creative ways. Two of the most popular activities for Easter celebrations are egg decorating and egg hunts. Unfortunately, many times these activities are very basic and predictable, making them less enjoyable year after year. With a bit of creativity, however, they can become more unique and memorable. In addition to creative egg decorating and egg hunts, there are many other fun ideas that can be great Easter party games and activities to celebrate spring. Some ideas are perfectly suitable for both religious and non-religious Easter celebrations, or they can be adapted for any Easter or spring party theme. 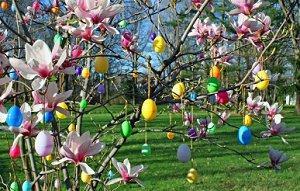 Egg Trees: Use colored eggs, flowers, ribbons, and other accents to make a tree "spring" to life. Charitable Activities: Filling Easter baskets for senior citizens or children's hospitals, volunteering for different organizations, or setting up an Easter food drive can be refreshing and rejuvenating activities. 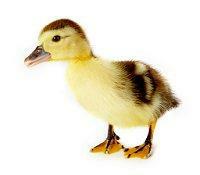 Farm Visits: Meet spring babies such as bunnies, chicks, lambs, and ducklings by visiting a farm in spring. Hatching Chicks: Many farmers will offer chicken eggs for hatching for a small fee. With a proper incubator setup, anyone can learn about spring chicks firsthand. Easter Origami: Creative origami projects could include recreating spring flowers, animals, and eggs. The finished projects can be beautiful Easter gifts, party decorations, or party favors. Molding Chocolates: Instead of buying the same old Easter candy, families can mold their own chocolates in fun spring shapes. Different flavorings can make the treats even more unique. Scripture Skits: Reenacting the story of Easter or different parts of the life of Jesus Christ can be a fun activity for Sunday School or children's youth groups. Easter Cakes: Baking an Easter cake from scratch can be a delicious challenge. Rabbits, baskets, eggs, and other popular shapes can be decorated to celebrate the season. Planting Seeds: Flower, vegetable, sunflower, and other seeds can be planted in small pots as a fun party activity with a spring or Easter theme. Making Baskets: Store-bought Easter baskets can be garish and flimsy, but a creative craft can be making baskets from popsicle sticks, knitting baskets, or using other craft materials to create a unique and personalized basket. Piñatas: An Easter-shaped piñata can become a fun holiday tradition filled with delicious treats like jelly beans, chocolate eggs, marshmallow candies, and other popular snacks. Hop Like a Bunny: Learning new jump rope techniques or holding a jump rope competition can be a great way to jump into spring. Romantic Easter Getaways: A weekend vacation to a country bed and breakfast inn can be a romantic way to celebrate Easter surrounded by the beauty of the countryside. Potted Palms: Celebrate Palm Sunday by planting a small potted palm to commemorate the season. 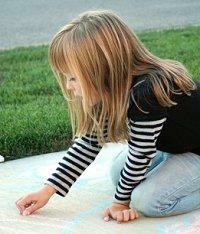 Sidewalk Art Gallery: Children and adults alike can enjoy drawing Easter and spring messages, pictures, and collages in sidewalk chalk for the entire neighborhood to see. Last Supper Dinner Party: The Thursday before Easter is Holy Thursday, and friends and family can gather for a Last Supper dinner party to share the joy of the season. From romantic getaways to dinner parties to fun games and unique decorations, there are many fun ideas for Easter that can make this spring celebration unique, memorable, and enjoyable year after year.